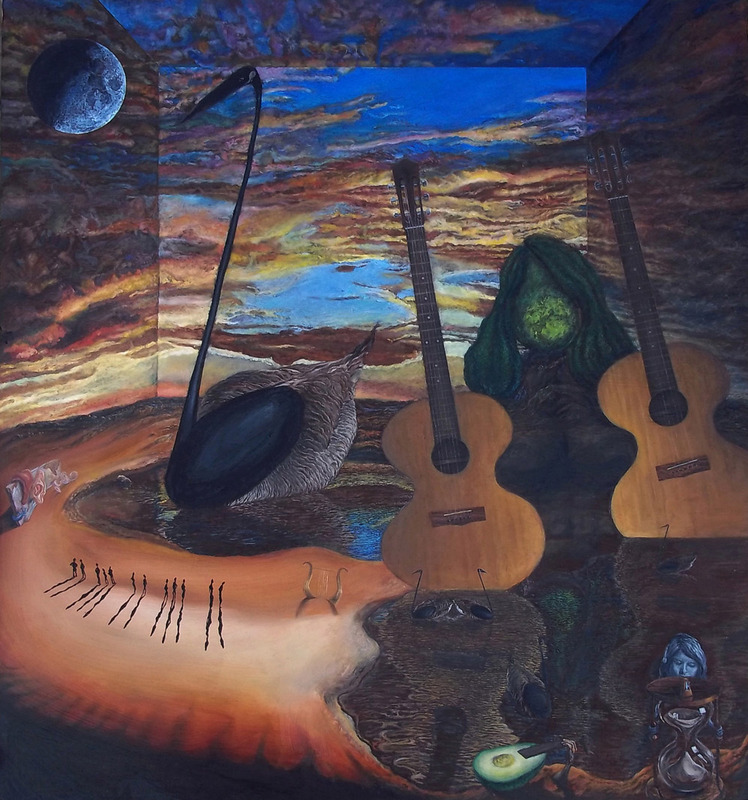 This painting is series of double images in homage to music through the manipulation of imagery that relates to musical iconography. The large eighth note doubles as a Canadian goose, it is repeated several times in the foreground as more eighth notes/Canadian geese. The two classical acoustic guitars create a frame of a woman's silhouette. The still life head is created with a large Anjou pear representing her face and two gourds forming her hair. The woman is wearing a flamenco style dress which is created by the shoreline of the pond beneath the guitars. There is a row of small figures in the left foreground which cast long late afternoon shadows that double as the black keys on a keyboard. On the extreme left there is a small wall with all of the human elements relating to music either draped over, in front or sticking out of it. A tongue for singing, an ear for hearing and towards the back of the wall a small group of the bones related to hearing - the tympanic membrane (ear drum), the malleus, incus, and stapes (hammer, anvil and stirrup), along with the semicircular canals and cochlea. In the right foreground there is an avocado that doubles as a lute guitar body with a human hand playing it. The girl, wearing headphones, stares at a metronome which rests on top of an hour glass (both relating to keeping time). The hour glass doubles as her body. In the central foreground a lyre partially immersed in the sand is replicated and repeated in form by the two Canadian geese/eigth notes directly to the right of the lyre.